Your smart speaker just got smarter and groovier. Keep reading to learn how to get your Amazon Alexa or Google Home speakers to play WUNC Music anytime. 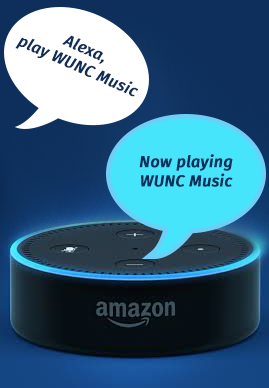 the first time you use the skill, say "Alexa, open WUNC Music and play live stream". When you use the skill in the future, you can just say, "Alexa, play WUNC Music." Just say "Hey Google, play WUNC Music From TuneIn"
Need help geting this to work? Email us and we'll help!